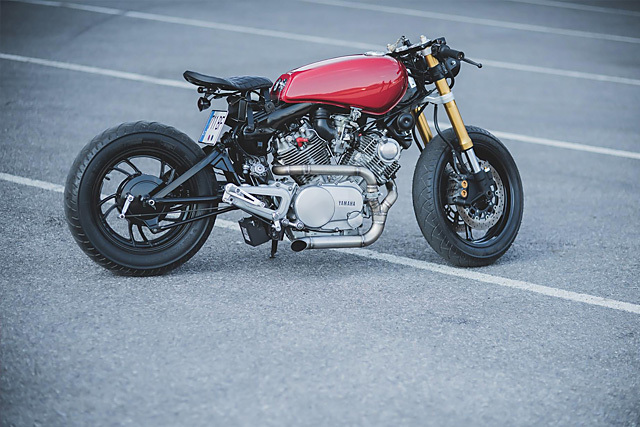 Having already built a host of murdered out custom Honda’s and a brilliant Suzuki GSX750 they turned their attention to the XV with the intention of letting a little more colour shine and showing off their increasingly well-rounded fabrication skills. Older Japanese bikes aren’t cheap nor easy to find in Lithuania so no example can be wasted nor part thrown away. So even though much of the bike has been modified the tear down process is a case of saving everything that can be salvaged and only trashing the absolute unessentials. With the design they had in mind the rear subframe was removed, the front forks put to the side and with the engine out the frame and driveshaft equipped swingarm were given a coat of their favourite black paint. 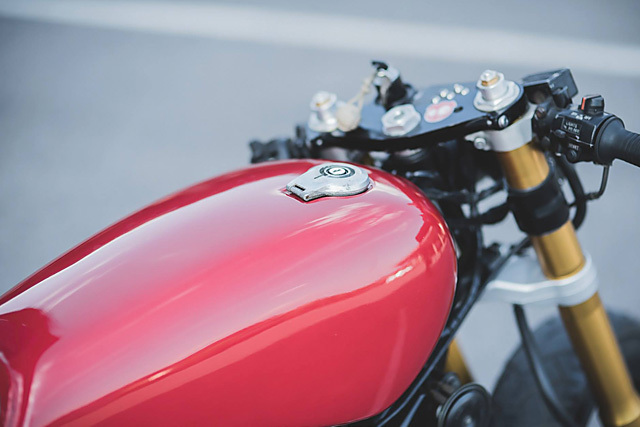 The standard tank remains but has been body worked to perfection, as it came with a host of free rust and dings, so the deep red gloss paint now lays down brilliantly. Having been de-badged and fitted with a new petcock and filler cap it allows the sides of the tank to really show off the colour and the skill with which it was applied. 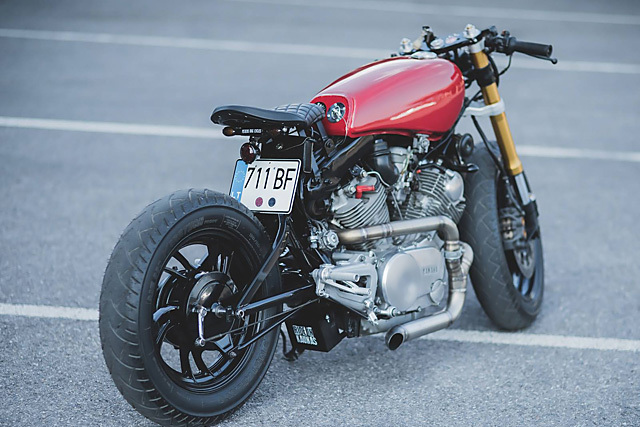 To date the PDC builds have either retained the standard seat or the ability to ride two-up, but with a V-Twin on board and a host of cafe’d XV’s already on the internet they opted instead for a bobber look. To make it work new seat supports were fabricated in-house and can be adjusted to suit the rider. 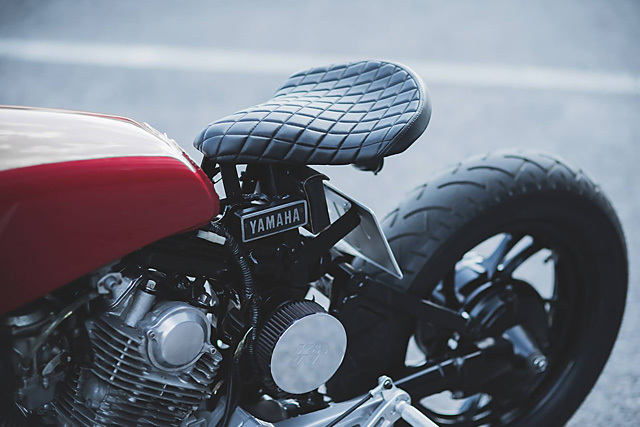 While topping it off is a classic black leather bobber seat and a small leather bag underneath for some retro flavour. 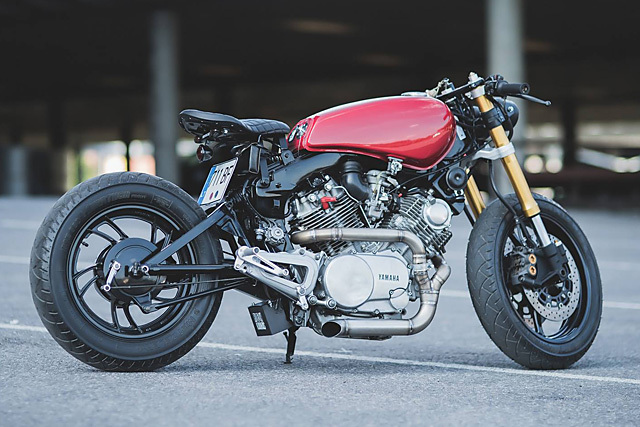 That V-Twin is of course Yamaha’s air-cooled 748cc unit that provides endless torque and the sort of reliability you need in a parts scarce country. But even though it came to them as a functional bike, Gediminas and Gytis made sure they gave it the once over with OEM consumables and a thorough clean and polish. With the ugly factory exhaust on the floor and no chance of being refitted it gave them another chance to display their fabrication skills to their increasing following. Gone is the ’80s cruiser look and in its place is a hand fabricated 2 into 1 system that follows the curves of the engine and ends in a side exit baffled pipe for a barking loud exhaust note. With the seat gone the battery is now hidden in a custom box below the swingarm and a rewire to ensure spark is never interrupted. Although the XV comes from the factory with that laid back cruiser look, skinny telescopic forks and all, there was no way a PDC bike would ever be allowed to remain that way. So delving into the Yamaha parts bin they come up with a far more sporty solution to both the look and ride of the XV. 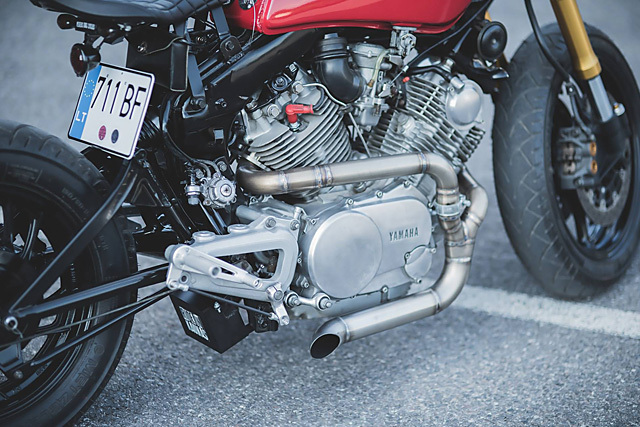 The front end now wears a Yamaha R1 set of fully adjustable USD forks that drastically brings the front end closer to earth and levels out the XV’s stance. With the front wheel and axle of the R1 retained it also made perfect sense to run the four piston caliper, twin disc brakes from the modern Yammy to beef up the braking. It’s a good thing too as the blacked out front and rear wheels wear Metzeler rubber that show all the signs of just how hard the boys ride their bikes. 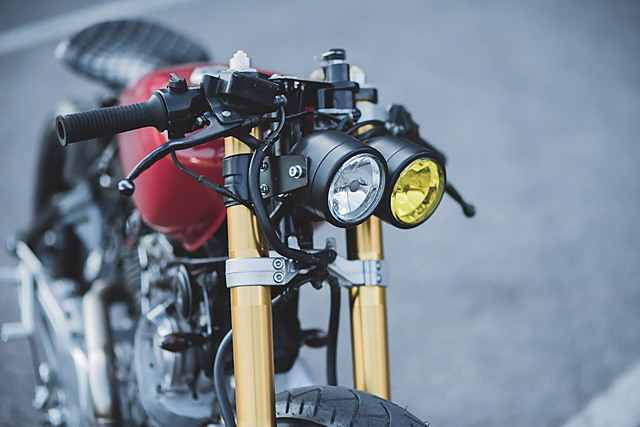 Now with a clip-on front end there is a mix of old XV and more modern R1 items fixed to the bars, with the older pieces like the switchblocks given a full refurbish and the master cylinder treated to new lines. 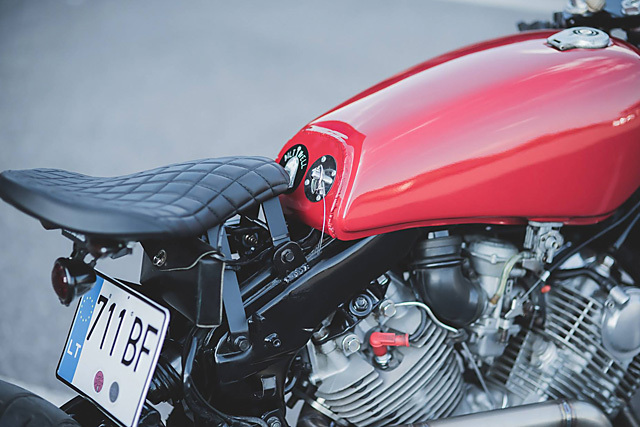 The foot controls are also given the sportier feel and function with billet rearsets adapted to the bike with custom rods that join the stock linkages. The lighting also makes a statement with the indicators hidden front and back, the taillight mounted under the new seat and the twin projector headlights in a mix of clear and yellow adding another visual element to an already impressive machine. 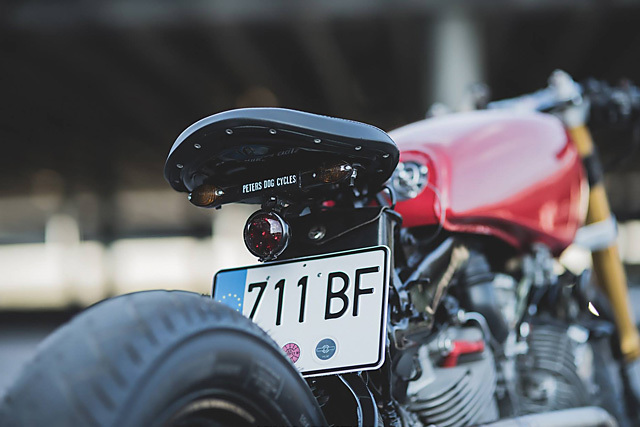 To ensure their new project would pass the often strict European road rules a custom bracket was fabricated and mini LED idiot lights installed next to the ignition switch. With the key turned on and the XV750 thumping away next to their other stable of rides even the addition of colour doesn’t make their latest build look anything at all soft amongst the murderer’s row. 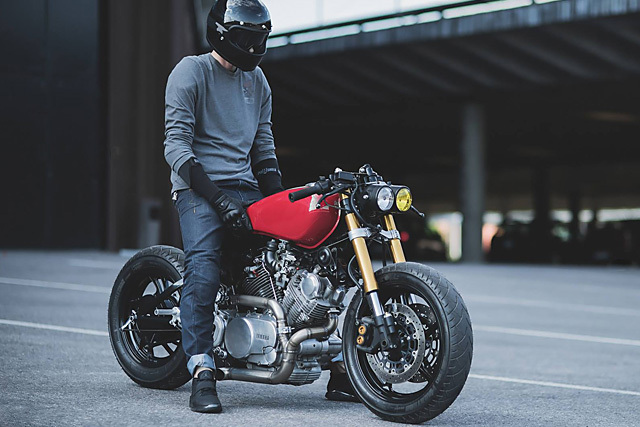 For Gediminas and Gytis there is no plan to stop, there is already a Triumph Thruxton in the works and the aim is to spread the custom bike culture across the country both when parked up and especially on the move. They may have giant shoes to fill, but this new “Other Dream Team” is intent on taking it to the world and inspiring hope in a nation where one-off exotic machines were once an item only seen on the internet, but never heard. Thump thump, there’s Hogs for lunch!